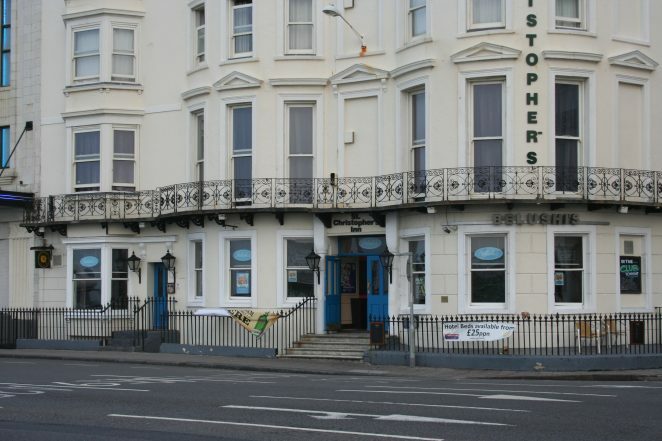 At a recent family wedding reception, held at the Royal Albion Hotel, in-between the wedding breakfast and the evening disco, I sat in the bar of the Harry Preston Suite with my sister having a drink. To the west the outlook was towards Pool Valley, and to the south, Grand Junction Road, the beach and the Palace Pier. “Do you remember Louis Tussard’s Waxworks, somewhere near here when we were kids” I asked her? “Well of course I do, we would come off the Palace Pier and beg mum to take us in!” By then mum had probably spent more money than we could afford on the pier, and home was the only thing on her mind. Mostly we were allowed to watch the enactment from the Edgar Allan Poe story ”The Pit and the Pendulum” through the large front window. The window display, with waxworks effigy and scythe-like pendulum swinging slowly back and forth, about to cut the prisoner in two, was used to entice the public in. Occasionally, under constant duress from three young children, mum would give in and let us go in. I would always head for the “Chamber of Horrors” The Hangman, Dr. Frankenstein’s Monster and Sweeney Todd the Demon Barber of Fleet Street. Unlike today, with children’s computer games overflowing with violence, back then censorship was more stringent; the most chilling thing I had seen was Dr. Who being threatened by the Daleks! I would hide behind the sofa, and peek out to see the Daleks, and although frightened, not want to miss the next episode! We quickly crossed Pool Valley, but the buildings there still didn’t look right! “Well I thought I knew where it was, but I’m not so sure now,” said my sister, I’m certain its close by, but none of these look right!” So who can remember exactly where Louis Tussard’s Waxworks was? I recall the ‘Pit and the Pendulum’ display in the window, Peter, but as a child, I never had the money to go into the waxworks on my holiday visits to Brighton. Nor do I know when the place closed, but if pressed, I feel that it was situated to the left in your westward view but then again, maybe not. Peter, I remember the waxworks very well indeed. Because my family moved to Brighton in the early 60s, I seemed to be in there 3 or 4 times a year with visiting relatives from Birmingham. Although the frontage is very different, I’m sure it was where Bar Roque now stands. I vividly remember oriental gentlemen’s heads popping up and down out of pots in the window display by the pay desk. Another waxwork figure I remember well was Quasimodo swinging on the bell at the end of the chamber of horrors. There were lots of contemporary showbiz waxwork figures, including pop stars and the cast of Coronation Street. I don’t think the likenesses were particularly good, but you could just make out who they were meant to be. I’m a person who hardly forgets a face, so I think I know where the wax figures may have ended up. My wife is from Cornwall and on one of our visits she took me to Flambards theme park in Helston. As part of the park, there are some exhibits on Victorian Life and Britain in the Blitz, I’m sure the wax models in those exhibitions are the same ones from Louis Tussaud’s. I think I saw the Beatles dressed as Victorians, Jack Walker from the Rovers Return as an ARP warden and the Queen Mother working in a shop during rationing. Because the likenesses were not that good and they were out of the clothes you would normally associate with them, the wax models seem anonymous, but as I said I do remember a face. I recall seeing the waxworks pendulum from the street, and since my memories of Brighton start in September 1964 (when I came to Brighton as a student) it must have been open then. However, I can’t remember where it was. The site of the old wax works is in your first picture. It is the middle building with two black signs over the windows, hard to make out in the picture but possibly bar rouge. You can find a photo of it in its hey day on the reverse cover of “Brighton Behind the Front” book. When I was about nine I remember my older brother daring me to go into the Chamber of Horrors on a visit to Louis Tussaud’s back in the early 60s. The thing that scared me was the big bell swinging back and forth with Quasimodo on it and the sound of the bell, “Bong…….Bong”. That gave me nightmares for weeks. I worked at Brighton Job Centre around 1977 and took details of a number of vacancies from Louis Tussaud himself. He was very charming. He would phone and say he needed a new cashier or attendant and I would ask him what the job entailed. He would reply along the lines of ‘Well, we come in at about 9am and Sonia will make us all a cup of tea. Then, about 10am Mary might go and buy some cakes and make us another cup of tea. At about 12 we usually have lunch……’ I guess there wasn’t too much to do. I remember the wax-works downstairs was where all the horror was. But what sticks most in my mind is the big panda which was modeled on a famous one from China and if you put a penny in the slot it would move. This was in the 1950s when my dad would take us there. There was a sailor sitting in the window laughing. Hi Michael I remember the heads popping out of the pots; they were from Ali Barber and the 40 thieves. My sister and I never went in very often but we used to love trying to guess which head would come out next. Happy memories and so sad that it is no longer there. I moved to OZ back in the 70s but I often search for childhood memories on the pc. I have an original ‘see our Chamber of Horrors’ advertising board from Louis Tussauds. It promises ‘Where models move like human beings’ and mentions The Man in the Iron Mask, the Hunchback of Notre Dame, John Halliday Christie and the Hall of Mirrors. My dad aquired this – though I have no idea how! Tricia, I’d love to see a photo of that! Anyway you could add it to this website? 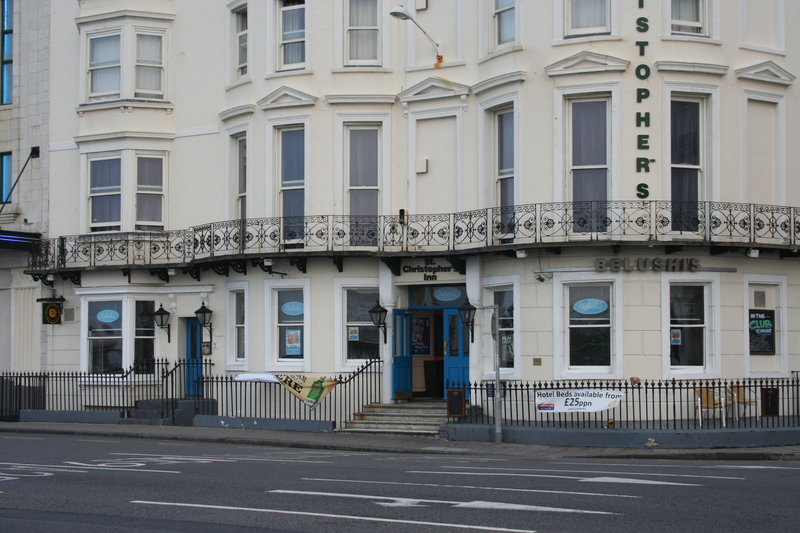 You have brought back so many memories of that place and Brighton. I was 14/15 at the time in 1974 & 75; and would bike with my friends from Eastbourne for the day – there and back. I couldn’t do it now! Our day was always filled (like it was for the first time with this activity) as soon as we arrived. The pier and the Ghost Train. Followed by the dolphins and the waxworks. I had forgotten the Pit and the Pendulum till I read above. But does anyone remember after paying for ‘Sleeping Beauty’, on the left going in, the breathing?? Yes, you have all jogged my memories. The Chamber of Horrors, heads popping out of pots and, yes John, I remember Sleeping Beauty breathing. Born and bred in Brighton we couldn’t afford to go in much but we must have gone in a few times. Has anyone got any photos of it? Anne, look for the tab at the top RH side of the page for Part 2 of the story, and a photo of the waxworks! Does anyone remember the model of a man in a cage just beside the cash desk? If you put your hand between the bars he would shake your hand. This would have been in the 1940s. I remember as a child, standing in front of the glass case enclosing Sleeping Beauty and watching her body ‘breathing’. It fascinated me. What a shame the place no longer exists. My parents took me there several times about the late 1940’s/early 50’s. 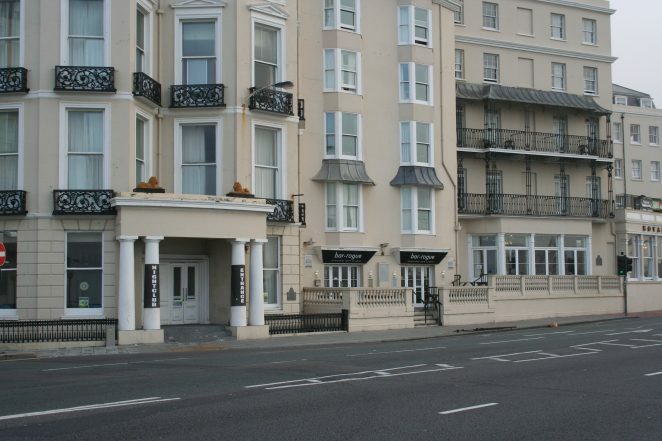 I worked in Brighton at the Grand hotel after it’s reopening. Born a few miles north of Brighton I spent much of my youth on the pier and going to concerts at the Dome and Brighton centre. I also worked in a bar called the Nelly Pecks on North street I think it was, does any one remember this bar? I’m hoping to take my daughter back to see my home town this summer. I live in the South of France, I just hope it hasn’t changed too much, that I recognise the streets. Are the Lanes the same as in 1991 when I left? I remember the waxworks. I came to Brighton on a day trip with my family in the summer of 1977, and we visited the waxworks. One of the main exhibits that I recall, was a large figure of Frankenstein. We all thought he looked rather funny, because he looked just like Jack Parnell, the TV music composer. I used to visit Brighton in the 70s as a child as my grandma lived there. I remember the Waxworks well, particularly a display of fairy tales / Alice in Wonderland. I’d love to see a photo of that as it really stuck in my mind. Hi, I’m trying to add a photo of the Louis Tussaud’s place with my dad in the fore ground but I can’t see how to attach a photo? Mail me on jennifer@mybrightonandhove.org.uk and I will help you with the photo.